Derek - Hello there and welcome this time to Hills Road Sixth Form College. We've come here with some new Naked Scientists colleagues of ours who are new recruits to the show and are going to do some live experiments for us. I wonder if you could tell us who you are and what you do please? Chris - I'm Chris Muirhead and I'm a lecturer at Birmingham University in the School of Physics and Astronomy. Derek - Ok and we have got some seriously amazing experiments that Chris has set up for us and we're ready to do. We've also got some fantastic participants here from Hills Road Sixth Form College. Guys can you just tell us your names and what year you're in please? Jemma - I'm Jemma Raven and I'm in year 12. Will - William Brook, year 12. Derek - So what we have here is a big pot of some stuff. It's in a cylindrical canister which is about two feet tall and ten inches across and Chris has actually got some pretty amazing experiments to do with this stuff. So Chris, what are you about to do? Chris - Well I'm just about to take a piece of ordinary garden hose, which you can see is a really soft and flexible piece of material, and I'm going to lower it into this liquid and going to see what happens to it. Derek - Ok then. Will, tell us what you see. Will - Well it's all spurting out everywhere and frothing over. And it's coming out of the end of the tube, which is above the level of the liquid. Derek - Ok, so we've dropped it in there. Now what Chris? Chris - I'm going to take it out and now you're going to see what's happened to the properties of this material. What you can see here is that the material has gone completely hard and solid. Instead of being flexible, it's absolutely rigid. And just to show you how rigid it is, I'm going to take it and I'm going to smack it on the floor. Derek - Ok, Jemma, tell me what happened. Jemma - It's in lots of little pieces on the floor. Derek - So Chris basically smashed that thing on the floor and we are now pretty much treading on tiny pieces of shattered garden hose. So that went from being bendy to being very very solid. We're going to find out what was going on there. So Chris, please give us a bit of an explanation. Chris - Before I tell you exactly what happened to the garden hose, perhaps we ought to spend a few minutes thinking about what we as scientists think about as a low temperature. What you probably mean by low temperatures is what happens when you open the door of your fridge and it's cold in there. That would have a temperature of perhaps a few degrees above freezing point. From our point of view, that is really warm and far too warm to enable us to do some of the experiments that we're going to show you today. Derek - So from your point of view you mean as a scientist working with this sort of stuff. Chris - Yes, that's very warm stuff as far as we're concerned. If you go out into a really cold day in the Antarctic, perhaps I could ask our friends here from the college what you think would be a really cold day in the Antarctic. Derek - So what do you think is the coldest the Antarctic ever gets? Will, what do you say? Will - About minus 100 degrees? Chris - Not quite so low as that. About minus 89 degrees, and that's the coldest temperature that was ever recorded to have occurred naturally on Earth. If you go down now to 196 Celsius, the air around you will turn into a liquid. Now we can't quite show youl iquid air, but what we've got in this bucket is liquid nitrogen. Derek - You've mentioned liquid nitrogen there Chris. I wonder if these guys have heard of liquid nitrogen at all. Jemma, have you ever heard of that stuff? Jemma - Yes, we had a few demonstrations at school. Derek - Ah so they've already seen it. But the question is then, why does it work? Why is it a liquid? Chris - It's a liquid because when things are hot, the thermal energy causes them to move around very fast and that prevents them living close to each other which they have to do in a liquid. As you cool a gas down, the atoms move less and less rapidly, and eventually the attractive forces between the atoms hold them together in the form of a liquid. If you go even colder, they turn into a solid. Derek - So I suppose the usual example for this would be water. When we have it at room temperature it's a liquid; if we take it very cold it becomes a solid which is ice; and then if we heat it up to 100 degrees it becomes steam which is the gas. Chris - That's absolutely correct. 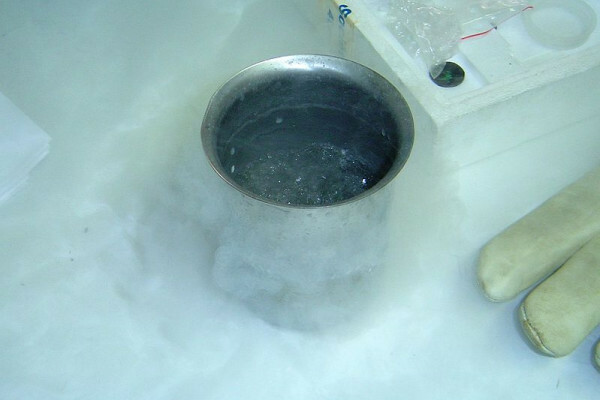 And what happens with the liquid nitrogen is it turns from a gas into a liquid at this temperature of minus 196 Celsius. Derek - Ok then. We took a piece of rubber tubing and put that into the very cold liquid and then we were able to smash it. It became brittle didn't it. Why did that happen? Chris - Well for a rather similar reason that a gas turns into a liquid. Temperature is a physicist's rather fancy way of saying jiggling around. When you cool things down, they jiggle around less and less. When you take a piece of rubber and you bend it, it's important that the atoms can move past each other, because when you bend it you're changing its shape and the atoms have to move. If you cool it down, the atoms become locked into position so they can't move past each other and the material becomes very brittle. Derek - Ok so you've put a piece of rubber hosing into liquid nitrogen and the tubing clearly didn't enjoy it. What would happen if we put living things into this kind of temperature? Chris - Over here we've got some parsley, and what I'm going to do is take this parsley and I'm going to lower it into the liquid nitrogen. Derek - Ok well before we do that, Will and Jemma, we've seen what the liquid nitrogen will do to the rubber tubing. What do you think will happen to the parsley? Will - I think the parsley will snap because it will freeze and the water won't be able to slip past each other and so it won't be able to bend at all and the force will just break it apart. Derek - Jemma? Any thoughts? Jemma - Just frozen parsley. Derek - Indeed. So let's stick it in. Chris - Ok here we go. As far as the liquid nitrogen is concerned I've just stuck something red hot in there. It's like putting a red hot poker into some water and it causes it to boil. The parsley is now very cold, and we take it out and there you are. Parsley all ready to put into your favourite dish. Derek - So what Chris has done there is to immediately rub it around in his hands and it's immediately just gone into chopped bits, which I must say that if I'm cooking with parsley would take quite a while. So that's quite a good culinary application of liquid nitrogen there. Chris - Absolutely correct. What you have to be a little bit careful about is not to stick your fingers in there. If you stick your fingers into liquid nitrogen then your fingers will go solid like the garden hose did and when you warm them up again they'll go soft again just like the garden hose did. Unfortunately they'll be permanently damaged because what you will have is severe frostbite. A few days later they'll start to go black and you'll lose your fingers. Derek - Ok then, thank you very much for that experiment. I'd just like ot quickly ask Will and Jemma what they thought about it. Jemma - Very interesting and very good to see. Derek - And Will, what about you? Do you think that liquid nitrogen might have a good application in the kitchen maybe? Will - Well I was shocked at how smashable things were when they are at very low temperatures. And so you could chop up lots of different vegetables like that. Derek - Yeah I think it could make life very easy in the kitchen. So there you go, a bit of kitchen science there in the end from us. Thank you very much to Chris who's come over from Birmingham University and to Will and Jemma from Hills Road Sixth Form College. That's all from us. We'll be back next week, as always, with some more kitchen science. So please do join us then. Until then, goodbye. How do creatures in sub-zero environments keep their metabolisms working? Will wet hair give you a cold?